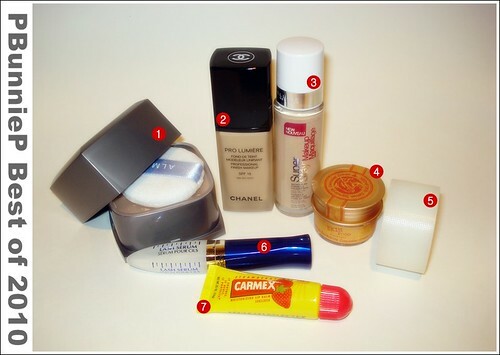 I want to share with you some of my favourite products of 2010, ones' that I have been consistently using or that I have found super-interesting. 1. Shiseido Aqualable Creamy oil Cleanser: I’m sure you all know my love for cleansing oils because they are fast and effective way to remove makeup. This product is a cream looking cleanser that quickly turns into oil once you rub it on your face, a great product to travel with because it’s more solid and you don’t have to worry so much about leaking everywhere. It works just as well as any other oil cleanser I’ve tried and I love it mainly because the concept is so cool! 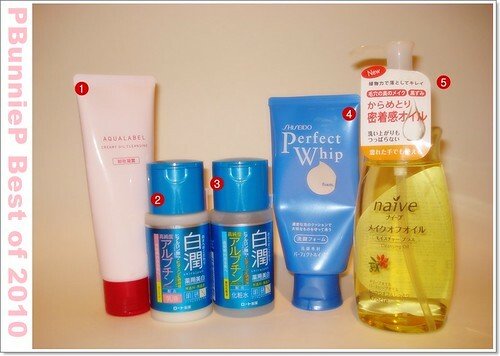 2 & 3: HadaLabo Shirojyun toner + lotion: these are fantastic products! I love how it truly hydrates your skin and KEEPS it moist for the entire day. I have the whitening range and it works great to fade the darker area on my forehead. Overall, my skin just looks brighter and feels plump with this. Absolutely no irritation whatsoever. 4. Shiseido Perfect Whip is probably by far my favourite cleanser. I do try new things every now and then but this one just really works for my skin. It creates the most luscious foam and makes my skin feel refreshed without any unnecessary minty feel that some other products use to give the illusion that you are fresh. I use it on its own, I use it with my Clarisonic. A very impressive and affordable product from Shiseido. 5. NAÏVE Olive cleansing Oil: I put this product in too because I do adore it and enjoy using it every much. This is oil has a gentle fragrance and has just the right consistency (not too thin, not too thick), plus it does emulsify quickly and rinses off well. In fact, this is probably the only oily cleanser that I would okay to use without using another foaming cleanser afterwards. A great pick for those who are scared that oily cleansers are too thick or suffocating. ALMAY Loose Powder: I do believe this is actually a discontinued item. Being one who rarely uses loose powders (or even powder at all), I picked this up because it was affordable and I trust Almay for non-comedogenic, hyp-allergenic products. I was surprised to find out how much I liked this; the powder is so light but completely transforms the face when you apply it after foundation. I use it with a powder PUFF and pat it onto the skin, the result is a beautiful smooth and even finish. CHANEL Pro-Lumiere Foundation: this one is no-brainer. I’ve talked about this often as one of my favourite foundations. It hasn’t been getting enough love because I keep trying out new products but when I’m looking to impress and I need a product that I can rely on, I always reach for Pro-Lumiere. My only gripe would be the lack of colour selection and the price of course. But having said that, I do believe this is a department store product that is truly worthy of its price-tag and I’d repurchase it in a heartbeat. MAYBELLINE SuperStay foundation is a new product that I’ve only recently started using but I’m already quite certain that we will have a long and happy relationship together. At a great drugstore price it offers med-full coverage, does not accentuate my dry parts and leaves a satin-like finish on the skin. It doesn’t really stay that long in my opinion but it has no problem going through 5hrs or so without touching up. SKINFOOD Salmon Concealer is not a thick or heavy coverage concealer. However, it won me over with its creamy texture, moist finish and colour correcting powers. This is NOT meant to be heavy coverage but rather neutralize undereye darkness, for a lot of people this is enough to wake up the face but if you need, you can certainly put a skin colour concealer over it. This is really one of the first products I’ve found that actually does make a different without being noticeable. TAPE. TAPE? Seriously?!?! Yes. I put this in here because this year I have learned how to cut my own eyelid tape. I’m still not pro at it yet but most of the time I can get it right. L’Oreal Eyelash Serum is a wonderful product for those with brittle or dry lashes. I only apply this at night because it does leave a slight film on the lashes but it really moisturizes my thin lashes and prevents fall-out from using waterproof mascara from day to day. CARMEX, this is the year that I discovered and became insanely addicted to Carmex. It smells rather funky like herbs or something but it works great for dry lips and leaves a shiny finish so I even wear it as lipgloss sometimes. BONNEBELLE Liplites is something I have owned on and off for many years. I believe it was one of my first makeup items because it was a lipgloss-like product and I could say that it wasn’t really makeup. Its been repackaged now and while I’m not always crazy about the scents, the product itself is still rather good. I use Strawberry Parfait for that lovely babypink lip. MAC Ombre Blusher (Azalea Blossom LE) is more of an interesting product for 2010. Now I’ve never thought purple was a workable colour for my cheeks but this ombre powder gave a delicate flush to the cheeks. I love wearing this with the Lady GaGa lipstick since both are cool toned. Really, I promise, it will not turn up purple on your face as long as you use alight touch. RIMMEL Lasting Finish Blush is probably the best powder blush I’ve used from the drugstore so far. Overall, it has everything I need, enough pigmentation to show up but not look overdone, great price and it is indeed longlasting. No need to reapply. NYX Blush stick is something I’ve discovered just recently but I think its so great for a drugstore product that I threw it in here anyways just to show you guys about it. I got mine at Walmart in the States and down there it is a permanent item. I have been using it almost everyday since I got it because it shows up great and doesn’t just blend into nothing (whats the point then right?). It portable and a five star drugstore item in my books. & 15. 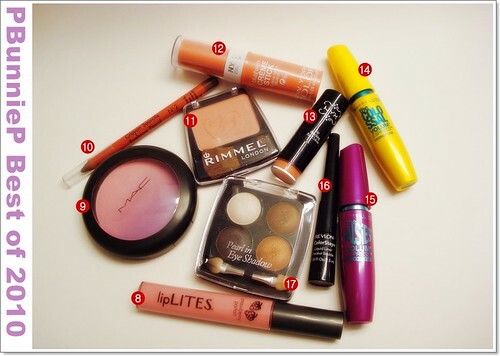 MAYBELLINE Mascaras (Collosal and Falsies) are my top picks for mascaras…ever. I have tried department store brands such as famous Lancome mascaras and even Dior but I always come back to Maybelline. It just works for my thin lashes and the waterproof versions keep my lashes nicely curled until I get home. I can’t quite tell what is the different between the new ones that keep coming out, they all just look like remade versions of the Volum’ Express but yes, the Volum’ Express is my HG! REVLON ColourStay eyeliner is something I will always have in my makeup bag. I love the felt-tip applicator, I love the non-smudging formula even though it does not claim to be waterproof (I don’t think). In fact, it stays on better than a lot of my gel-liners. DAISO Pearl Eyeshadow Palette is one amongst my many many brown palettes but it is the one I use most often. The colours are right, they show up nicely and (as you know) I love a metallic/pearly finish. One stop makeup in a pretty quad for $2, what more can I ask for right? WOW this is a loooooooooooooong list but I’ll throw in one more picture at the end of the nailpolish that I loved this year…..
Hope you enjoyed and feel free to leave a comment and let me know YOUR favourite item of 2010? glad you like the aqualabel one!